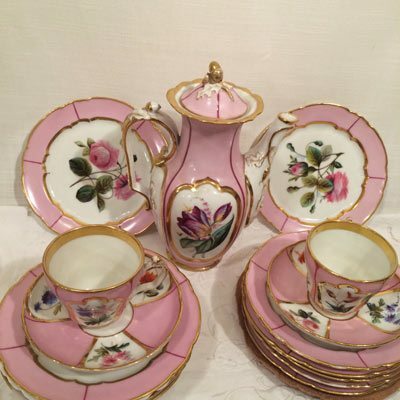 I have been asked many times how to care for antique china. I have had an antique store, Elegant Findings Antiques for twenty six years, which specializes in beautiful antique china. I feel it is my responsibility to care for each piece of antique porcelain until it finds a home where it will be loved and appreciated. First of all, you do not have to worry if you get a beautiful piece of antique china. It is not hard to care for it. You should either decorate your home with it or use it on your dinner table. The first rule of owning a special piece of antique porcelain or a dinner service is to enjoy, enjoy, enjoy!!! If the piece of antique china is for decoration, you can put it in a cabinet where you can have the pleasure of looking at it. If it is a decorative plate, put it on a wooden plate stand on a piece of furniture in your room or in a cabinet. Do not use a metal plate stand, as it can chip the plate. You can also hang the plate on the wall. I would advise you to get the plate hangers that have plastic around the edges, so they do not scratch the painting or remove the gilding on your plate. On the wall, you can enjoy the beauty of the plate every time you walk by it. If it is a vase or a figurine, put it on a piece of furniture or in a cabinet in a place that you can see it and enjoy it. If you leave it out, it would help to put a doily under it to prevent it from chipping if someone picks it up and puts it back down. Washing antique china is not very hard. First of all, lay a towel or a rubber mat on the bottom metal surface of the sink just in case you drop it or bang it. Of course, this will probably never happen. If it is a double sink lay a towel over the metal divider of the two sinks also. When you wash the piece of antique china, use a soft cloth or soft paper towel and a mild soap like ivory liquid. Never use any soap with bleach or citrus scented products. Also, please never use any abrasives like steel wool. An abrasive can ruin your china by taking off the gilding, which is often real gold or scratching the hand painted piece. A soft cloth and a mild soap is best to use. Also use lukewarm water and not scalding hot water while cleaning your antique china. I wash the china pieces by hand to prevent any breakage. I wash one piece at a time, and I wash my silverware after I finish washing my antique china. If the food is caked on the plate, I would soak the plate in warm water with ivory liquid in it for a few minutes to loosen the food. I would not advise you putting the antique china in the dishwasher. Dry the china with a soft white linen or cotton towel or a soft white hand towel. When you store a dinner service, I would suggest buying either coffee filters or inexpensive thin paper plates to put between the plates and the bowls to stop them from rubbing. Some sets come with felt dividers which would also be a good option, I would not use the foam dividers as they can stick to your plates. Often, you will see dinner plates or other plates that have the gold worn off the center from stacking the plates. This can be prevented by using coffee filters or paper plates between them. Keep all antique china stored in a place which is not exposed to temperature extremes. Now it is time for you to enjoy your wonderful antique china dinner sets or your antique porcelain decorative pieces. They are meant to be enjoyed and not to be kept locked in a cabinet unused and unloved. Enjoy the beauty and detail of those antique porcelain vases, figurines, urns, clocks and centerpieces by using them as decorations in your home. In this way, you will get much pleasure from them every day for the rest of your life.